Its Sunday morning. I am not in Oruro, Bolivia — a small city some three hours outside of La Paz, Bolivia. It is set on the Alto Plano, meaning a high altitude plain. The temperature while riding was about 10 degrees celsius. The temperature in my hotel room is about 10 degrees as well — yes, there is not heating. A couple of days ago I sat down with my friend Leo to work out the remaining itinerary — roughly what towns to stop at, and what roads to take. For the most part, roads have been very good in most countries. My next major sites of interest are Salar de Uyuni (the world’s large salt flat, and once a sea) and possibly a silver mine in Potosi. Potosi was reportedly once the wealthiest city in South America due to its silver deposits and millions of indigenous and African slaves/workers perished over the years. Digression: it was announced to me that breakfast was is being served so I’ve gone up to the top floor where there is much need sun. I notice that the guy is changing the gas tank (like a propane tank) for the hot water heater — that explains the cold water. This hotel is now perfectly acceptable for me but many of my readers would probably not feel the same way, without having gone through a similar travel experience. A breakfast of slightly stale buns with cold butter and jam is welcome. Not because food is hard to find in towns but it is tedious to deal with packing the bike and myself up, finding somewhere, putting the bike somewhere and so forth. Coffee, like in Peru, is generally served in a small vessel, often cold, and you and it to a cup of hot water or milk to your desired strength. Its cold enough in here that my coffee became cold since I wrote the above paragraph but the sun is pleasant. This hotel may have been something in its day. It is multi-story but decrepit. There are signs of water leaks, and chipping paint. I don’t suppose it would be more than 1-2 stars back home but it was a small oasis for me. The reason being is that I, as always, am venturing into uncharted territory. I hadn’t planned to stop here. I was getting dark and I didn’t want to press on. I hadn’t read, or realized, that Lonely Planet had a section on Oruro. When I arrived I was a little uncertain about where I would be staying at all. I flagged down a European couple and inquired about hotels. They said I was in the right area. The hotel they were staying at didn’t have parking. Having headed towards one of the Lonely Planet suggested spots, I saw a hotel that looked like it had big enough doors to ride my bike into the back. I inquired and they actually had secure parking, and even wifi in the geriatric decorated suites. Not bad for chance. Speaking of chance, for fork seal started leaking in Peru. Yes, this was the one “fixed” by Desert Racing in Lima. In La Paz, I went to a couple of Honda shops — even though the police ride KLRs — there is no KLR dealer. The first place couldn’t see me until Monday (it was Friday). The second place had a seal that wasn’t quite correct — but perhaps my best option. I was instructed to come at 8:30am the next day. Having stayed in an expensive hotel because I got sick to death of riding up and down La Paz’s hilly streets — and the worst traffic I have *ever* been in in my life — and splurged on somewhere with secure parking — I arrived a little late to the Honda shop. They were not open yet. Annoying. I was about to head to yet another shop further away and without great directions when I say a red old model KLR ride by. I glanced. He glanced. And we both pulled over. Gonzalo and I begin a conversation. His English is mediocre but I manage to convey me need for mechanical assistance. It turns out his friend was involved in procuring some 400 KLRs for Bolivian police forces — a donation from Venezuela’s government. We went to his apartment and spoke. After having procured some fork oil, I returned and I followed Patricio in his BMW car down to a shop nestled in the police forces club premises. There were a number of KLRs there and dozens and dozens of Chinese “Condor” bikes — I am told a thousand boxes. Patricio had access to a stock fork seal from a mildly crashed police KLR,. He performed the work (and an oil change) in a very professional manner. We discovered that the likely cause of my leak was because my spare oil seal was installed *upside down*. So Desert Racing: damaged my dust deal for steering bearing, stripped my brake pins, installed new front tire without balancing, or even aligning “red dot” (light spot) with valve stem, and installed my forks seal upside (and slightly dinged an important bushing). That is a four out of four misses. I’m sorry that I went there and I’m sorry that I paid what I did. As it stands, it seems that my bike is in ridable condition. Proper suspensions is always necessary, but vital for the trip down to Uyuni. La Paz was a very busy, congested city that reminded me somewhat of Quito, Ecuador. Here I ran into Luis and Noodia (spelling?). I almost missed Luis’s KLR as I assumed it was another police bike. I had run into these two earlier that day and we shared some photographic moments as well as helping each other with our KLRs on a rickety barge crossing which is necessary when crossing from Copacobana. It turns out that I had bumped into Luis some time back — we believe in Nicaragua. I had crossed paths with three Argentines pulled over in the dark. It turned out that they were having bike problems. They parted ways later and Luis met up with his girl friend. Luis was helpful in trying to sort out directions for the Honda shop and a hotel. Luis had returned to Cordoba, and without a doubt, I will be visiting him in a few days en route to Buenos Aires. I had traveled from Cuzco, Peru to Copacobana, Bolivia. This was the easiest border crossing to date. Copacobana is a neat little town on the shores of the high altitude lake “Titicaca” — it is the highest significant lake in the world. Previous to that I had spent several nights in Cuzco at the “The Point” party hostel as part of my Machu Picchu adventure. My stay at The Point was passable in that I had a bed and a place for the bike but I found a lot of the back packers rather inconsiderate. I had stayed at other packpacker joints before, but this is the only place where people really made little attempt to leave sleepers undisturbed, and people didn’t seem to mind mixing their gear with others. Just not cool. If you are 20-something 24×7 partier this might be the place for you. So Thursday I woke up quite early and took a cab to the town nearby Cuzco to catch the train. Leo had helped me out the prior day in arranging tickets, itinerary and so forth. I boarded the train — and spent a good chunk of the morning freezing — I should have brought more layers. The train ride was about 3.75 hours. I listened to music most of the way and watched the scenery. The round trip ticket is just shy of $100. Upon arriving in Aguas Calientes, I then need to pay my entrance to Machu Picchu (something like 130 soles) and buy a round trip bus ticket. Aguas Calientes is the expensive gateway to Machu Picchu. Food seems to be about three times the prices as Cuzco. The bus ride up the mountain took about 20-30 minutes. It probably took about six hours to get to MP from hostel to entrance gate. I spent about three hours wander around Machu Picchu. It was a bright sunny day and there were quite a few guests. Its architecture is quite spectacular, and the masonry work is impressive. Not surprisingly, I took many photos. I am very glad that I went, albeit if I was to do it again, I would stay in Aguas Calientes and break up the tedious travel time. 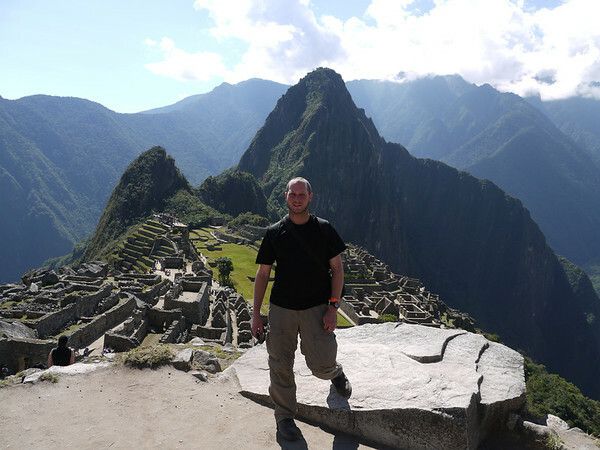 7am to 9:30pm — with 3 hours in Machu Picchu. There are better ways to do this. In some ways, I think MP is over-hyped. By this I mean I have seen so many images of it and so many tourist related advertisements. It is certainly breathtaking — but I guess I expected it to be a little more surreal. Its tricky to describe my feelings around it. I think maybe it has become to “pre-packaged”.